Everyone has something they were terrified of as a child. Sometimes it was the shadows lurking in the closet, sometimes it was the malevolent clown doll perched on the highest shelf, and sometimes it was that creepy house across the street. But what happens when those imagined dangers, often considered the folly of childhood, become a very dangerous reality? The answer, of course, is Monster House, the directorial debut of Gil Kenan (City of Amber). 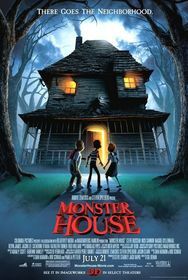 An innocent and yet surprisingly mature film, Monster House explores both the mystery of the neighborhood's haunted house and the complexity of adolescence with minimal belittlement. Offering a fresh take on an old idea, Monster House approaches its youthful themes with maturity, dignity and a healthy dose of good ol' supernatural fright, making it nothing less than a top-notch children's horror film. DJ is a young boy living in the heart of suburbia. He has two very stereotypical suburban parents, a dorky best friend, Chowder, and, of course, a very unorthodox hobby. DJ, it seems, likes to spend his free time spying on his elderly neighbor, who is in the habit of chasing misguided children off his lawn and stealing their toys. Things only get more bizarre when the old man, suffering a heart attack, is taken out of the picture, abandoning the house. A bit displeased by the change in events, the house develops a rather disturbing habit of sprouting teeth from the woodwork and trying to eat those who come a little too close. DJ and Chowder now have a very large, very intimidating concern and no idea how to begin dealing with it. Their solution, however, comes with red hair, freckles, and a back-up supply of Halloween candy in a red wagon. Jenny, the brains of the operation, has arrived, and after narrowly avoiding premature devourment, the adventure can begin. The main characters of the film are complex and delightfully immature, vital characteristics that are highlighted by the animation style. Shot in a very simplistic, Claymation style, the lack of depth highlights both the character's childishness and places an emphasis on character traits rather than visual effects. Additionally, while the animation is simple, it is well thought out. There is an apparent attention to details, including Jenny's freckles and Chowder's corduroy pants, that reinforces the idea that while these characters are children, they are not without dimension. The aura of immaturity accomplished with the animation is helped by the use of relatively unknown, young actors, preventing the audience from associating older, celebrity voice personae with the children. A brilliant move in casting, the integrity of the characters' youth adds a sense of genuineness and realism to the film, creating engaging characters to whom audiences of any age can relate. Furthermore, because the characters are children on the cusp of adolescence, the horror of the monster house seems all the more believable, thriving in a world rife with youthful imagination - imagination that would be unavailable in a more adult setting. Unfortunately, as a means to amplify the childishness of DJ, Jenny and Chowder, the filmmakers rely on serial stereotyping of any adult characters in the film. Obviously meant to depict the world as children see it, this pervasive stereotyping creates a flat, two-dimensional environment that detracts from the complexity of the film. While certainly successful at placing the emphasis on our three young heroes, this success is a hollow one; there is nothing else to focus on, the setting failing to add any dimension to the film. Additionally, while meant to be humorous, the stereotypes (including an air-headed babysitter and a career gamer-geek) are often condensed and ridiculously simplistic to the point of being off-putting. By simplifying the children's world, Monster House commits a single, detrimental affront to the complexity of its main characters, portraying the world they perceive as simple-minded. Clichéd but appropriate effects, such as slightly sentient grass and ghostly images in the windows, give the impression of a haunting, creating complacency along with mild suspense and the inkling that, perhaps, things aren't quite right. Having settled into the quiet knowledge that the kids are dealing with a simple, familiar, safe haunting, Monster House delivers a very satisfying jolt when, unexpectedly, the house bursts to life, complete with eyes, mouth and, most disturbingly, very large, wooden teeth. This revelation changes the dynamic of the film, moving it from the realm of sleepy haunted house to a more active, monster setting. The children are no longer faced with an ethereal, ghostly challenge. The fear they must confront is real. This brings us to the crux of the film, what separates Monster House from many prepubescent horror flicks, such as Watcher in the Woods or more recently The Haunted Mansion -- Monster House is nothing short of a mature coming-of-age story. All three of the characters are just entering puberty and approaching the concept of impending adulthood in their various ways. DJ strives to be responsible, Jenny overcompensates by being a know-it-all, and Chowder holds onto his childish ways with an iron grip. However, rather than focusing on how these children become adults, Monster House is an homage to the middle ground of adolescence. Instead of defeating the monster house by becoming adults, DJ, Chowder and Jenny succeed by becoming children who act with thought and purpose -- but who are still children nonetheless. Further, the tangibility of the monster -- a haunted house that can apparently get up off its foundations and put up a darned good chase -- represents the reality of teenage challenges. After all, once you've faced down a living, carnivorous house, junior high seems easy. Relying on the gradual introduction of the fantastic, Monster House weaves an entrancing mystery, slowly building suspense and suspicion around a house that, while definitely creepy, seems mostly benign. When the film switches gears to become a full-on monster movie, it adds a sense of urgency to our heroes' challenge. As we watch DJ, Jenny, and Chowder become teenagers, not adults, it becomes apparent that Monster House is a rich, complex, and effective children's horror film that brings to light not only the dangers of the supernatural, but also the anxieties of growing up. Submitted by Rich Dishman on Thu, 2011-01-27 10:12. Thanks for bringing more attention to a movie that does not apologize for being a children's horror film yet has enough story, characterization, and humor to be enjoyed by older viewers too. Good review!